This tutorial guides you through the steps of creating an executable application that can be deployed to a Windows based operating system without needing the LiveCode IDE to function. Using the LiveCode Integrated Development Environment (IDE) to develop and test your applications is a great way to work, but not everyone has LiveCode installed or uses the same platform as you do. You may also want to distribute your work in such a way that other people do not see how you have implemented the functionality - for example if you sell your app. LiveCode allows you to save your application in formats that can be deployed to a range of platforms. This tutorial guides you through the fundamental steps of saving your LiveCode application for deployment to a Windows based operating system. In order to create a standalone LiveCode application you first have to create an application in the LiveCode IDE. In this example, we are using the 3-5-7 game. 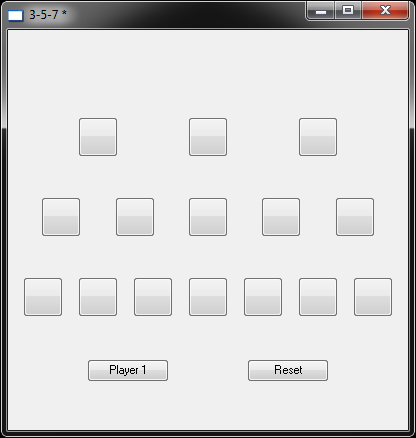 You can find out how to write this game here: Game 3-5-7 - A Simple Interface. 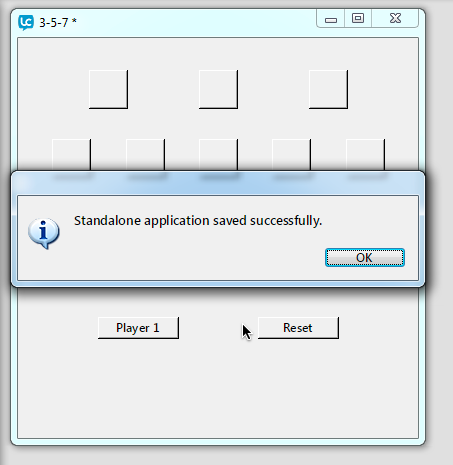 Once you have an application you would like to create as a standalone, save its stack but do not close it in the IDE. The application must remain active in LiveCode. Then open the Standalone Application Settings dialog box. You open this by selecting Standalone Application Settings... from the File Menu (1). This dialog box provides an overview of the standalone platforms that are supported and other features you can add and configure for standalone applications. Select the platform you would like to deploy to. 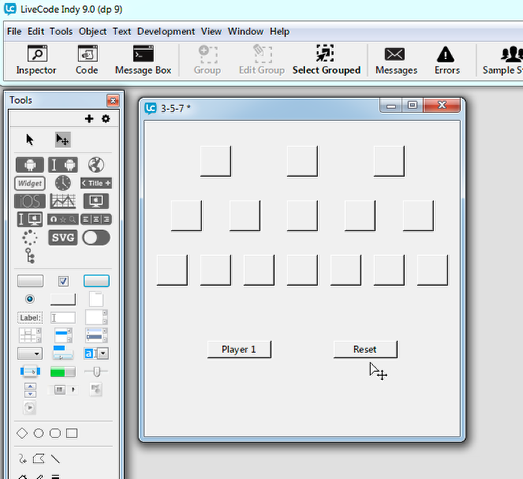 In this case select the Windows icon (2). This opens the Standalone Application Settings for Windows deployment. Make sure that the Build for: Windows box has been selected (3). This also adds a small green tick mark next to the Windows icon. 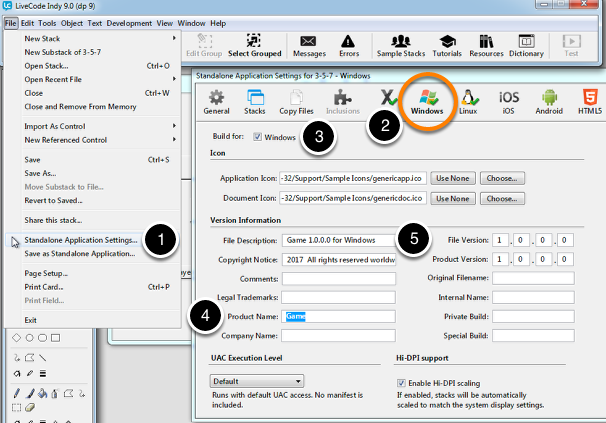 The other Standalone Application Settings can be configured with your preferences that are specific to the application. Here we have added the word "Game" to the Product Name field (4) and added the word "Game" to the beginning of the File Description field (5). Next, dismiss the dialog box. This completes the required configuration for a basic standalone build. You build the standalone with the configuration you set up by selecting Save as Standalone Application... from the File Menu. This initiates a sequence of events that are accompanied by dialog boxes. If your application has been modified and the most recent changes are not stored on your hard drive, you are prompted to save the active stack. You are then prompted with a dialog that allows you to select a location into which you can save your standalone application. Once you have accepted this dialog and your standalone has been saved, you should see the message that is displayed on the screen of this step. You can access the standalone by following the path to the standalone application area you selected as part of building the standalone application. Look for the file with the .exe extension and try to execute it by double clicking on it. This should open and display the application in a way similar to that shown in the image of this step. This tutorial presents the fundamental steps for creating a standalone application in LiveCode that runs on Windows, but LiveCode supports more platforms, including Linux, Max, iOS and Android. For information on deploying to iOS, have a look at the following lessons: How do I Build an iPhone Application for iOS?. Build failed for Windows: could not open output file"
this error would suggest that you do not have permissions to write to that directory location. Try writing to a different location to which you know you have write permissions. I made a stack that reads a bunch of text files, manipulates the data, and creates an HTML file in a subfolder. Works great in IDE mode. But when I turned it into a standalone program, it didn't generate the HTML file. No error messages, but no file, either. there could be many reasons why you are not getting an output file. My initial assumption would be that you have an issue with the path and file name you are trying to write to. Have a look at the specialFolderPath function in the LiveCode Dictionary and follow links to other related dictionary entries from there. For debugging, you could also launch an answer dialog that shows you the path your application is trying to write to. Maybe the file is being written somewhere you are not expecting. I have a hello world tester aving successfully as a standalone windows app, but when I try to run as Android app I get "There was an error while saving the standalone application could not compile application class"
yes, in order to build standalones for Android you need to reference the Android SDK in LiveCode. If you do not do that, you will get the error you are describing. This tells you how to set up your Android environment, so that you can build standalones. App won't run. Did the Hello World app. Saved as stand alone. Copied APK to phone. Selected it for install. APP not installed is the result. The emulator behaves very much in the same way as an Android device, whereby you should be able to select either the device or an emulator from "Development -> Test Target". You may get an "unknown deployment platform" message if you do not specify what the target is. There are a number of key points to implement in order for the Android development environment to work, and these points are covered in the relevant lessons I referred you to in my previous comment. I would imagine that it should not be necessary for you to uninstall and reinstall all the software again, but you should ensure that you have the latest version of LiveCode (6.1). There was an issue with a previous version of LiveCode and the Android development environment. 2. Start Android, this should automatically open the package manager. 2.1. Ensure that at least the Android 2.2 (API level 8) is installed. 3. Open LiveCode and ensure that LiveCode can see the Android installation. 3.1. You can set this up under Preferences -> Mobile Support. 4. Create an Android emulator AVD or plug in your Android device. 5. Start developing code for Android. If this did not help address the issue, then please feel free to contact our customer support at: support@runrev.com or have a look at our mailing lists and forums (http://livecode.com/community/) for information from our community. You may find that someone somewhere has had the same issue as you have at the moment. 353,0,0,stack "C:/Program Files (x86)/RunRev/LiveCode Indey 8.1/Toolset/lbraries/revsblibrary.livecodescript"
The words "appendtolist" and "recursivestackfilelist" do not appear in the LiveCode forums. but I get this error: "could not compile service support class". 1. That you have installed the Android 4.0.3 SDK package. 2. If you are in Windows that you have installed Java 8. LiveCode is not currently compatible with Java 9 or 10 and this has been reported. We have a lesson on setting up Android here http://lessons.livecode.com/m/2571/l/625198-livecode-and-android-studio-8-1-5-onwards. Elanor, thank you for your fast response. It was exactly what I needed. I realize now that my question was incomplete. My goal is to create a Windows standalone app with an SQLite database. After extensive searching through the forums, stackoverflow, etc., I couldn't find anything that mentioned Windows, SQLite, and the error I was getting. That's because there is no such issue. I explored the Standalone Application Settings further -- adding Database to Inclusions (as I saw suggested in an old forum post), setting Property Profiles (for what reason I don't know yet), and retrying and re-searching -- until I saw that "Build for" MacOS and Android were checked by default. When I unchecked those boxes and reset everything else to the default settings, it worked like a charm. So the only issue in this case was my ignorance. I am very impressed with LiveCode and look forward to expanding my knowledge to include an Android version in my project. Thank you so much for your kind attention.